As we all know that Instagram is the fastest growing social platform that allows sharing photos and videos, but this doesn’t come up with a download option. That’s why today we are here to show you how can you download Instagram photos and videos easily. Instagram is very common name to all of us who are related with social media. Instagram is the fastest growing social platform that allows you to share your photos and videos. The Instagram app doesn’t automatically allow you to save photos (or even to zoom in, for that matter). Instagram has become a great collection of photos and videos. However, Instagram never put any official option to download photos and videos from it. When it comes to Android, there are several apps in the Play Store which can download photos and videos using such URL. When you’re checking out Instagram in a Web browser, it’s easy to save a photo that you like. 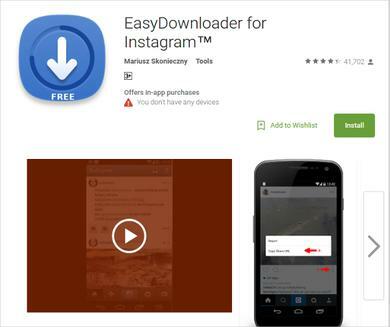 First of all, you need to download and install both Instagram and Easy Downloader for Instagram app on your Android 3.0 and higher device. Open the app to activate the download feature, then tap the Instagram icon near the top-right corner. Now simply minimize the app and open your Instagram app and go to the profile whose photo you want to download. When you come across a photo or video you want to save, tap the three dots under it and choose Copy Share URL. Now open your notification shutter and you will see your photo was downloaded. There are some similar apps available in the play store to download Instagram photos and videos on your Android, but it is the easiest way to download Instagram images directly on your Android smartphone. When you’re done downloading content, remember to exit the app so it isn’t running in the background. It’s important to note that you should not download other peoples’ photos or videos to pass them off as your own or use them for profit. Remember the policy and stay with us to get more.